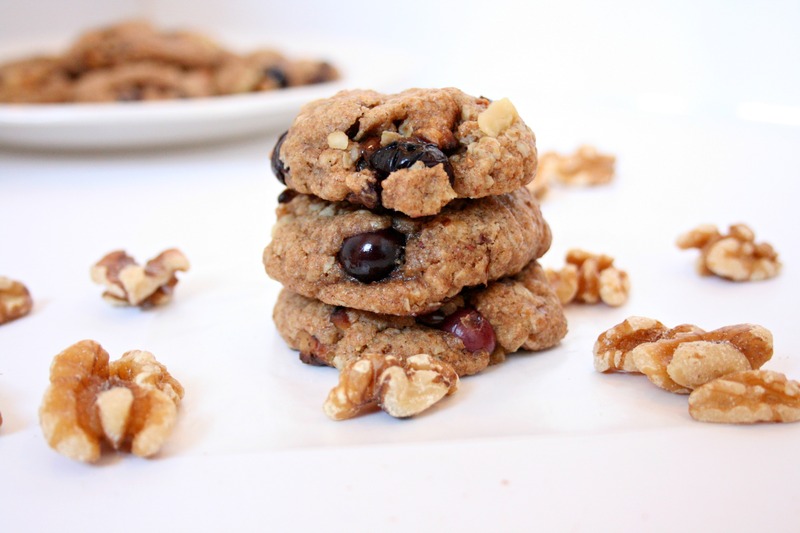 These chewy Blueberry Chocolate Chip Walnut Cookies are packed with fruit, nuts, oats, and chocolate to make one delicious cookie! They’re stuffed with all the goods! What more do you need in a dessert? I really should have named this recipe “the everything cookie”. What started as a simple oatmeal cookie recipe turned into these deliciously packed cookies made with just about everything- nuts, berries, and of course chocolate. Really what more do you need in a dessert? These cookies can be made any time of the year, but since blueberries are currently in season, it made them extra flavorful! Everyone can use some more antioxidants right?? 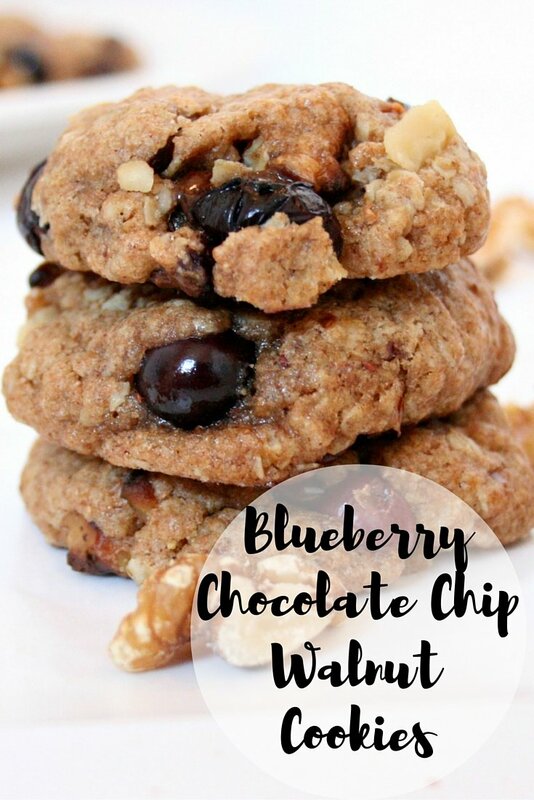 Chewy, crunchy, squishy, chocolaty, wonderful… man I can go on and on with adjectives to describe these delicious Blueberry Chocolate Chip Walnut Cookies. 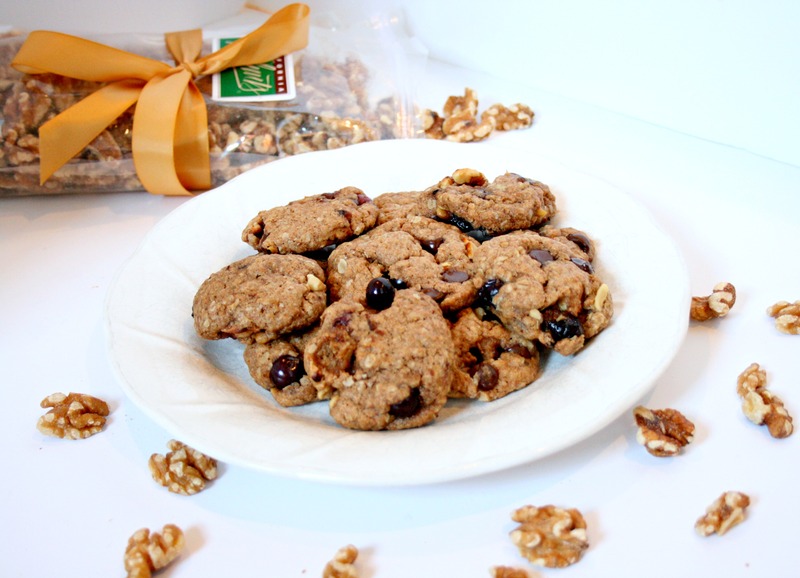 I made them with whole wheat flour and oats to sneak in some extra whole grains and of course some walnuts to add an extra boost of flavor and nutrition. Walnuts are a delicious and versatile ingredient that is the perfect complement to other whole foods for nutritious, tasty meals. Did you know that they provide many important components of a healthy diet? Just one ounce of walnuts has 2.5 grams of essential plant-based omega-3 alpha-linolenic acid (ALA), 4 grams of protein, and 2 grams of fiber to keep you feeling full. So why not add these nutritious nuts into my cookies? I love cooking with walnuts! They are so versatile! I use them in my homemade trail mix and granola and often top my oatmeal or cereal with them too. They can also be used to make pesto and complement other savory dishes. The chocolate mixed with the sweet tartness of the blueberries and the crunch of the coursly chopped walnuts makes for one delicious bite! I made these cookies for the girls I babysit for and they were gone almost instantly! I dare you to only eat one! Roast 1 cup of walnuts for 7-10 minutes in the oven. Let cool and coarsely chop. Combine dry ingredients ( whole wheat flour, brown sugar, oats, cinnamon, and baking powder) in a medium sized bowl. Add wet ingredients to dry ingredients until fully incorporated. Slowly stir in your chopped walnuts, chocolate chips, and blueberries. Roll into 1 inch balls and place on greased cookie sheet. Should make 12- 14 cookies. Let cool for a moment (if you can) and enjoy! Gotta love an everything cookie! Thank you so much Deanna! You really can’t go wrong with them! 🙂 Happy Sunday!! A combination of my two favorite things! Looks so yummy. These cookies are just packed full of yummy things! They sound amazing! Thank you so much!! They really were too good!